Yesterday while reading the epilogue of the book, written by Douglas Blackmon, Slavery By Another Name: The Re-Enslavement of African Americans From The Civil War to World War II, I read this fascinating bit of corporate history from one of the corporate giants of America, Coke Cola Inc. It tied that Coke Cola directly to the re-enslavement of African Americans into forced involuntary servitude in the early twentieth century. 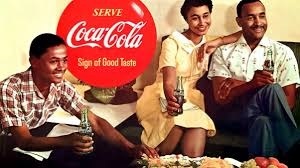 It put an entirely new meaning to that phrase " Have A Coke And A Smile" as it relates to Americans of African Descent. In addition to Coke Cola Inc., Americans of African Descent also seem to have a definite case of economic reparations against Southern Company, one of the largest power companies in the United States along with the major banking company Suntrust Bank. All of these cases tie directly to an icon of the business community of Atlanta, Georgia in the late 19th and 20th Century Joel Hurt. I will get back to Mr. Hurt's role in the deprivation of Americans of African Descent later. What fascinating me this afternoon was reading today's USA Today article about the legal pursuit that Tamara Lanier has undertaken against Harvard University for profiting off the slave photos ( daguerreotypes)of an African man named Renty and his daughter Delia taken in 1850 in a South Carolina studio by Professor Louis Agassiz, a Swiss-born Harvard biologist. Tamara Lanier is not only demanding that Harvard return these daguerreotypes but is also pursuing economic reparations from Harvard University for the damage done by the representation historically to her enslaved ancestors. The United States and its corporate entities have deliberately oppressed Americans of African Descent for centuries. This oppression we now know didn't end with the supposed end of slavery in 1865. It continued into more than 60 plus years of the 20th century. So the case for congressional hearings detailing the degree of harm handed out along with the amount due to make our black communities somewhat whole must be a significant factor in the upcoming presidential election. It also must be a factor in each and every congressional election that our community has the ability to sway the course of the eventual primary and general election victory. This is why each and every black community must reach of sufficient level of universal enriched literacy. For the strategic comprehending reader has the ability to flesh out the truths that are at our fingertips resource wise. Otherwise, the ignorance of our black history and the oppression we faced will continue to be covered up due to our inability to access that history collectively.